HELPING THE 21ST CENTURY CHURCH REFLECT THE 1ST CENTURY CHURCH'S SUBVERSIVE FOCUS. The major thesis of Streett’s book is that the understanding of baptism in the first century CE is different from its understanding in the twenty-first century. What he implies, but doesn’t spell out in detail, is that returning to the first century understanding would revolutionise today’s church. This is seen most clearly when we are almost half way through the book. He says that when he is teaching about baptism that his students questions are mostly of a theological nature, such as, “If baptism is required for salvation, doesn’t this mean we are saved by works and not grace?” Street contrasts this theological slant with asking what questions might have been coming from the persons who heard Peter on the Day of Pentecost. He concludes that Peter’s issues were of a “socio-political versus a theological approach to baptism”. (page 93) “He [Peter] was not teaching about regeneration of the individual, but regeneration of a nation. He was not talking about going to heaven when we die, but about calling his audience to pledge their loyalty to God’s kingdom. Repentance was turning their backs on former alliances. 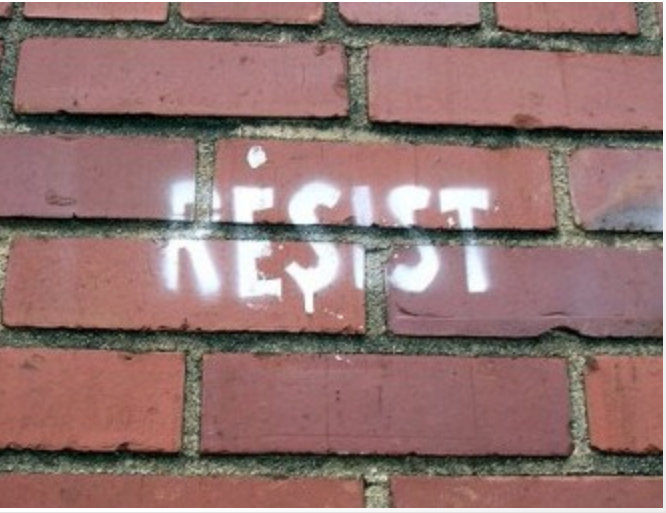 It was the first step of resistance.” Wow! Can you imagine how different your congregation would be if it operated like the first century church? Can you imagine a congregation that sees itself as bound to a loyalty that is clearly subversive of today’s powers that be? I like Streett’s making a distinction between two ways of seeing baptism. But I think I would phrase it differently from how he does. His dichotomy is between a “socio-political” and a “theological” understanding of baptism. I think both realities are theological. The first is what I would call a socio-political theology. The latter I would call a doctrinal theology. The first is based upon the Faith as a way of life; the latter is based upon the Faith as belief centered. In his book Streett does lay a firm foundation upon which a subversive church can be built. His gift in this book and his previous “Subversive Meals” is to translate and meld two strands of recent Biblical scholarship so they are more accessible to ministers and congregations. One strand of the latest biblical historical scholarship emphasises the overwhelming presence of the Roman Empire in the early centuries of the church. I have nearly 100 books in a bibliography I have compiled on the subject that have been written in the last two decades on the effect of the Empire on the early church and the New Testament writings. Warren Carter, author of several books on this topic, writes that the Roman Empire was not the background of the New Testament and the early church. “This book [“The Roman Empire and the New Testament”] is not about ‘Roman backgrounds’ to the New Testament, because it understands Rome’s empire to be the foreground”! With all the many books covering differing aspects of the Empire’s effect on early followers of Jesus, none of them deals with the place of baptism in this constant interaction between the demands of loyalty to the Empire and the call of God’s Kingdom. This is Streett’s unique contribution, not only to biblical scholarship, but also to the contemporary church’s self-understanding. For any of you who have not yet encountered writings on the omnipresence of the Empire on the daily life of first century followers of The Way, do not fear. Streett covers this topic well in his book. A key contribution by Streett is in showing how early Christians took over language used by the Empire, but used it in their own way. He shows how the word that was used by the Empire to speak of the oath that their dreaded soldiers pledged to Caesar, sacramentum, was appropriated by the early church. “Just as Roman soldiers pledged their allegiance to Caesar and Empire, so soldiers of the cross vowed their fealty to Christ and his kingdom.” In later times this word, sacrament, would have its use ascribed to other rituals of the church, like the Eucharist or Lord’s Supper. Street’s book doesn’t answer the question of “Where do we see today’s empire that demands our loyalty?” This is a loyalty that is over against our loyalty to Christ and the Empire (Kingdom) about which Jesus was constantly preaching. Streett doesn’t hesitate to infer the need to raise the question. The title of his book is “Caesar and [read versus] the Sacrament”. The subtitle is even clearer: “Baptism: Rite of Resistance”. We must be honest and say he is not the first academic who lays out the biblical and theological aspects of his subject but does not move into the pastoral implications of his insights. I had an email exchange with another academic asking him what were the practical implications of his book, which was on Christian Origins. His response was, in effect, I do the academic stuff and I leave it to others to draw out the implications. My own modest contribution is that I have begun a Blog and a Facebook page which I call “Subversive Church”. ( here and here) My goals are threefold: 1. Identify and archive congregations that presently see themselves as subversive to empire. 2. Identify tools that help congregations understand what it means to be subversive and materials for education toward being a subversive church, beginning with this book by Alan Streett. 3. Explore the issue of where we see Empire today. I solicit your contributions toward these three. Not to take too much focus away from the major thesis, but isn’t there also a difference between the 1st century and 21st century understanding of the New Testament teaching of baptism within the doctrinal theological aspect itself? As products of an analytical age that must (because it cannot not) divide notions “in order to distinguish” them, baptist preachers must incessantly emphasize the insufficiency of sacraments to save or transform. And, as products of an analytical age, people locate transformative power in the sacraments themselves as form without content. Was there ever a time before the distinction between form and content (works and faith) could even be thought? St James found it necessary to preach against the distinction as a division, but I let the question stand. Apart from socio-political application couldn’t the supposed ambiguity of the doctrine itself be resolved on these terms?